In the early 20th century, Germany had no colonies or naval bases in the Mediterranean. However, two years before the outbreak of World War I, the German Imperial Navy sent two cruisers to the Mediterranean. So after the outbreak of the war, the Royal Navy had to face the threat of the two German cruisers operating in these waters. According to Gary Staff in his book German Battlecruisers 1914-18, the German interest in having warships stationed in the Mediterranean goes back to the outbreak of the First Balkan War, which lasted from October 8, 1912, to May 30, 1913, when the German General Staff decided to have a German Mediterranean division. So the battle cruiser SMS Goeben and the light cruiser SMS Breslau were dispatched from Kiel, Germany, on November 4, 1912, to Constantinople in the Ottoman Empire. John A. Mizzi, in his book Gallipoli: The Malta Connection, says the two German cruisers visited Malta between November 12 and 13, 1912. They arrived at Constantinople on November 15. With the outbreak of Second Balkan War on June 29, 1913, the Mediterranean division was ordered to remain in the area. On October 23, 1913, Rear Admiral Wilhelm Souchon assumed command of the squadron. SMS Goeben and SMS Breslau continued their activities in the Mediterranean, and visited some 80 ports before the outbreak of World War I. Both Robert Massie in his book Castles of Steel: Britain, Germany and the winning of the Great War and Paul G. Halpern in his book A Naval History of World War I, give a detailed account of the Royal Navy’s pursuit of the SMS Goeben and SMS Breslau. The Imperial German Navy intended replacing SMS Goeben with its sister ship SMS Moltke in June 1914, but the assassination of Archduke Franz Ferdinand in Sarajevo, Bosnia-Herzegovina, on June 28, 1914, and the subsequent rise in tensions between the Great Powers made this impossible. When war broke out between Austria-Hungary and Serbia on July 28, 1914, Souchon was at the Adriatic port of Pola where SMS Goeben was undergoing repairs to its boilers. His two cruisers were outnumbered by the 27 ships of Great Britain’s Mediterranean fleet, a potential enemy. Engineers came from Germany to work on the ship. SMS Goeben had 4,460 boiler tubes replaced, among other repairs. Not wishing to be trapped in the Adriatic, Souchon rushed to finish as much work as possible, but then took his ships out into the Mediterranean before all repairs were completed. On August 1, 1914, Souchon received a wireless telegraph message informing him that Germany had declared war on Russia, and would soon declare war on France. The German warships were given orders to sail to Constantinople. With the repairs to the SMS Goeben’s boilers still unfinished, Souchon departed from Pola on August 1 and steamed south to join the SMS Breslau. SMS Goeben was joined by SMS Breslau at Taranto in Italy and the small squadron passed through the Straits of Messina to enter Messina harbour where Souchon was able to obtain 2,000 short tons (1,800t) of coal from German merchant ships. On August 3, while heading west, off the coast of Sicily, Souchon received the expected news that Germany had declared war on France. Souchon’s new course was taking him towards Great Britain’s Mediterranean fleet in Malta. Meanwhile, Admiral Sir Archibald Berkeley Milne started assembling his force at Malta on August 1. The Mediterranean fleet comprised three fast, modern battle cruisers, HMS Inflexible, HMS Indefatigable and HMS Indomitable, as well as four armoured cruisers, four light cruisers and a flotilla of 14 destroyers. On August 2 he received instructions to shadow SMS Goeben with two battle cruisers. By August 3, Souchon had departed Messina heading west. As the British ships approached Algeria, they unexpectedly encountered the SMS Goeben and the SMS Breslau coming straight towards them. 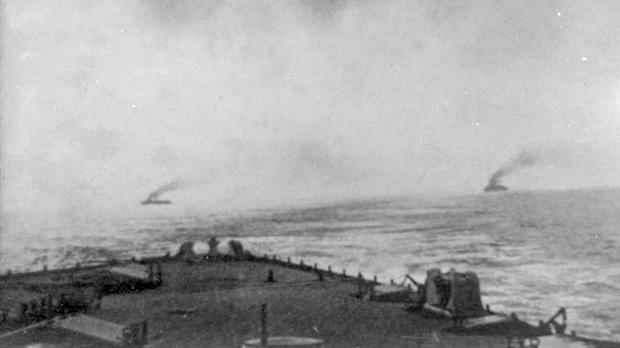 After passing the Germans, HMS Indomitable and HMS Indefatigable circled around and began to follow the SMS Goeben and the SMS Breslau back towards Italy. At 2pm, Souchon ordered his engine room to put on full speed in an effort to shake off the trailing British ships. Despite the trouble with the SMS Goeben’s engines, the Germans outran the British ships. By nightfall on August 4, along the north coast of Sicily, the SMS Goeben and the SMS Breslau pulled out of sight of their pursuers. Ignoring international law, Souchon entered neutral Italian waters and anchored his ships at the port of Messina, where merchant German coal ships were waiting for him. At Messina, Souchon’s crew tore the decks off the merchant coal ships, transferring 1,500 tons of fuel to the SMS Goeben and the SMS Breslau. With Italian officials urging him to leave immediately, the SMS Goeben and the SMS Breslau prepared to sail south out of Messina harbour at midnight on August 5. Britain officially went to war with Germany at the same time. As the SMS Goeben and the SMS Breslau left the harbour, HMS Gloucester sighted the fleeing German ships by the light of a full moon and reported to Milne. The next morning, the HMS Gloucester closed in and opened fire on the SMS Breslau and was in turn fired upon by the SMS Goeben. Near the western coast of Greece, the pursuit of the SMS Goeben and the SMS Breslau was taken up by four more British ships, led by Milne’s second-in-command, Admiral E. C. Troubridge. At 5pm on August 10, SMS Goeben and the SMS Breslau reached the entrance to the port of Constantinople. After several hours of negotiation, the Turks agreed to buy the German battle cruisers from Germany. Retaining their German crews, the ships were renamed the Yavuz Sultan Selim and the Midili. Souchon was made commander-in-chief of the Turkish Navy. He took the ships into the Black Sea where he bombarded the Russian cities of Odessa, Sebastopol and Novorossiysk. On October 30, Turkey officially joined the war on the German side. Meanwhile, a Malta-related maritime incident occurred after the outbreak of World War I. The April 2006 newsletter Friends of the Maritime Museum – Malta, recounts the incident. In the summer of 1914, the Austro-Hungarian steamer ss Carola of the Adria Line was carrying out daily mail trips between Malta and Syracuse under the contract of the Maltese colonial government. Britain declared war against Germany at 11pm on August 4, and at 6pm on August 5, while the ss Carola was about to leave Marsam­xett Harbour on its normal trip, it was not given permission to leave. During the same day, the Austro-Hungarian steamer Zichy was seized off Malta by British destroyers and detained at Marsamxett Harbour near the SS Carola. Belatedly, it was realised that Britain was not going to declare war against Austria-Hungary and the two ships were allowed to leave, which they did early in the morning of August 6. The ss Carola arrived back in Malta late on August 7. Meanwhile, early on August 8, presumably due to a misunderstanding in inter-departmental communications, the Admiralty in London sent a telegram to the naval authorities in Malta informing them that war had broken out between Britain and Austria-Hungary. The ss Carola was promptly boarded and seized by British sailors while its captain and crew were taken ashore for internment. 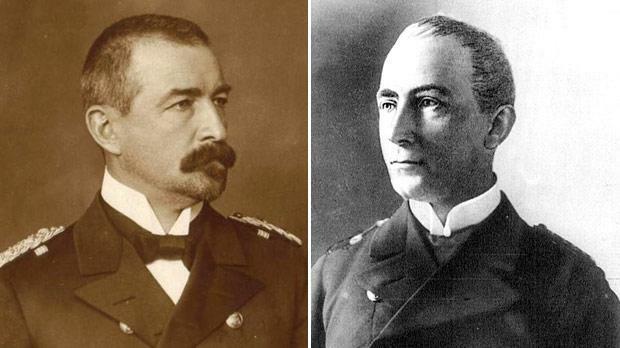 Later on August 8 the Admiralty discovered their error and informed Malta that war, after all, had not yet been declared against Austria-Hungary. The ss Carola was promptly released from arrest with apologies and on August 9 and 10 it left for Messina. It never returned. Britain declared war against Austria-Hungary on August 12. Meanwhile, after Britain’s declaration of war against Germany on August 4, 1914, the War Office sent most of the garrison of Malta to the Western front. Anthony Zarb-Dimech, in his book Malta during the First World War 1914-18, say that the defence of Malta was left in the hands of the Royal Malta Artillery (RMA) and the King’s Own Malta Regiment of Militia (KOMRM) which had 1,032 and 3,393 members respectively. 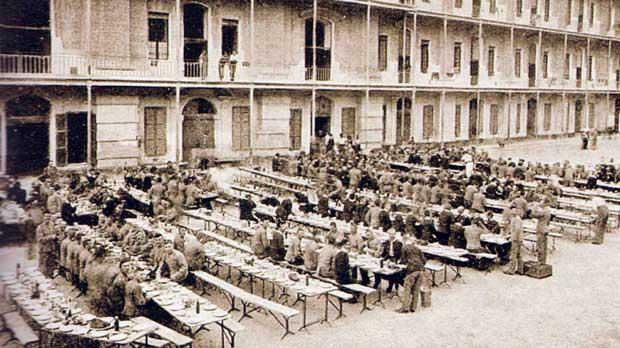 Zarb-Dimech says that during World War I, about 20,000 Maltese joined the British Empire forces. The RMA’s strength in 1914 was of 22 officers and 3,421 other ranks. On the outbreak of the war, the regiment was already at its war stations and the reservists were called back to the colours. Joseph Bonnici and Michael Cassar in their book Malta and British Army Infantry Regiments, say that when Germany invaded Belgium and France, and the regular troops, ammunition and guns stationed in Malta were sent overseas to the European battlefields, the territorials took over the defence of the islands.Two battalions of the KOMRM were mobilised. The garrison artillery consisted of eight companies plus the RMA, which manned the coast defence forts with 16 9.2-inch guns, 14 six-inch guns and 12 15-pounders. Regarding the coastal defence of Malta, Denis Rollo in his book Guns and Gunners of Malta, says that at the time of the outbreak of World War I in July 1914, the artillery component of the garrison of Malta was eight companies of Royal Garrison Artillery (RGA) and three of the RMA. The artillery districts and the companies consisted of Headquarters Royal Artillery Malta, Headquarters Eastern District RA, Headquarters Central District RA, Headquarters Western District RA and the RMA. There was some danger for Malta to guard against, for the German warships SMS Goeben and SMS Breslau were at large in the Mediterranean. They had bombarded the Algerian ports of Bone and Philippeville to hamper the movement of the French forces from Algeria to France. Another worrying factor was that Italy was a member of the Triple Alliance with Germany and Austria-Hungary and might have joined them in the war against Britian and France. 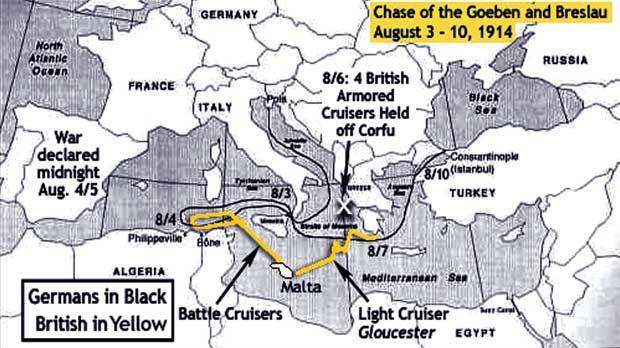 The Triple Alliance had been seen as a potential enemy, and the Admiralty War Order for 1913, still effective in August 1914, stated that if Britian found itself alone against the Alliance, the Mediterranean was to be abandoned and the navy concentrated at Gibraltar. In all other cases, the concentration would be at Malta, and in 1914, this fleet, under Sir Berkeley Milne, consisted of three battle-cruisers, four armoured-cruisers, four light cruisers and 16 destroyers. In October 1914, it was decided that St Paul’s Bay should be made an examination anchorage and there was therefore a need for an examination battery. The six-inch battery at Wolseley, although it existed, had been out of the approved armament for several years. It was agreed that the two guns could be moved from there to St Paul’s Bay. Between November 30 and December 10, No 1 Company RMA dismounted the guns and moved them to a gun position at the eastern end of Wardija Ridge. On December 31 it was designated Wardija Battery and remained in service during the whole of the war. It was allocated to, and under command of, Western Section RGA. The examination batteries were responsible for firing ‘bring to’ rounds in front of ships that were not obeying sea traffic regulations laid down. One such incident occurred on December 9 when the Italian ship Letimbro approached Grand Harbour during the official hours of night and a warning shot was fired well in front of the ship. The ship was later allowed to proceed. 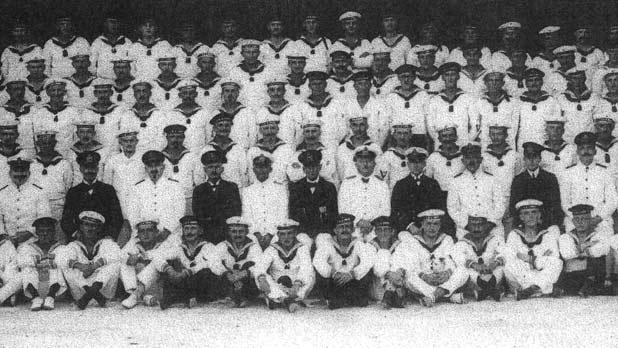 A group photo of the officers and crew of SMS Emden in Verdala Camp. Photo: Wolfgang Juncker, In Kriegsgefangenschaft auf Malta, Seeleute des Kreuzers, ‘Emden’, 1914-1919. In his book, Gallipoli: The Malta Connection, Mizzi mentions a Malta-related episode that occurred in late 1914, when an illustrious naval officer together with part of the surviving crew of SMS Emden arrived in Malta as prisoners of war (POWs). He was Franz Joseph, Prince of Hohenzollern, who was a brother of the Queen of Portugal, nephew of the King of Romania and cousin of the Kaiser. After Britain had declared war on Germany on August 4, 1914, Australian and New Zealand ships started transporting troops bound for the Middle East and Europe. They were escorted by Australian, British and Japanese warships. Thirty-eight heavily laden ships sailed from Western Australia early in November 1914 with 20,000 troops and the escorts kept were vigilant against the German cruiser SMS Emden. SMS Emden spent the majority of its career overseas in the German East Asia Squadron, based in Tsingtao, in the Kiautschou Bay concession in China. In 1913, it came under the command of Karl von Müller. The cruiser spent nearly two months operating in the region and captured nearly 24 ships. In late October 1914, SMS Emden launched a surprise attack on Penang, where it sank the Russian cruiser Zhemtchug and the French destroyer Mousquet. Müller then took SMS Emden to raid the Cocos Islands. He landed a contingent of sailors to destroy British facilities there, but on November 9, 1914 SMS Emden was attacked by the Australian cruiser HMAS Sydney. HMAS Sydney inflicted serious damage and forced Müller to beach his ship aground to prevent it from sinking. According to Mizzi, of its crew of 325, 141 lost their lives and the rest became POWs. However, according to Staff in his book Battle on the Seven Seas: German Cruiser Battles, 1914–1918, out of the crew of 376, 133 were killed in the battle. Most of the survivors were taken prisoner, though the landing party, led by Hellmuth von Mücke, commanded an old schooner and eventually returned to Germany. Mizzi says that the British decided to imprison the high-ranking officers and crew of this ship in Malta. The German POWs arrived here on December 6, 1914. The high-ranking officers were imprisoned in Verdala Barracks, while the rest of the crew was kept in Fort San Salvatore. Eight of them died in Malta and are buried in Bighi Naval Cemetery in Kalkara. Prince von Hohenzollern kept a diary during his stay in Malta. Müller, the captain of the SMS Emden, was given a room to himself. The other seamen were spread in various camps including San Salvatore, Kalkara and St Clement in Cospicua. Müller was held as a POW in Malta until late in the war, at which point he was exchanged and returned to Germany. Upon his arrival he was hailed as a hero and promoted to full captain. All of the ship’s officers, including the famous commander, were awarded the Iron Cross 1st class... the rest of the crew received Iron Crosses 2nd class. Relevant artefacts and information can be seen at Heritage Malta’s National War Museum in, Valletta.